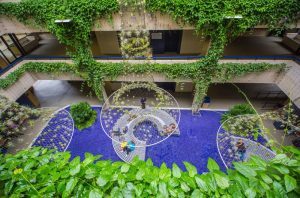 Three faculty members of the FIU Department of Architecture and Landscape and FIU Miami Beach Urban Studios (MBUS), were featured in the Architect’s Newspaper’s April 2017 issue. 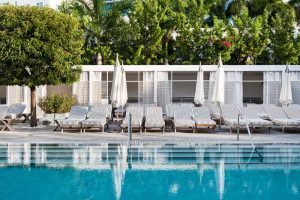 The article discusses Miami’s up-and-coming design scene and the hottest firms and studios in the city at this moment. Assistant Professor, Nick Gelpi (Gelpi Projects) and Assistant Professor, Nikolay Nedev (NC-Office) from the Department of Architecture were included on the list as well as, Landscape Architecture and Environmental + Urban Design’s Associate Professor, Roberto Rovira (Studio Robert Rovira). 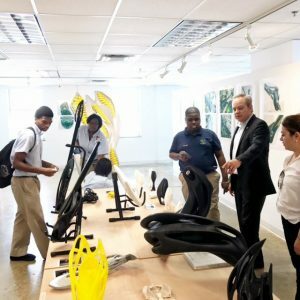 In addition to the faculty’s professional studios, FIU’s Miami Beach campus, Miami Beach Urban Studios, was highlighted for its research lab, 3-D printers and interdisciplinary collaborations. Below is the excerpt from the publication written on April 27, 2017. How does your practice’s ideology manifest through your projects? We are a design practice dedicated to examining the material relationships of building concepts by focusing on the collisions between materials and representation. What trends should everybody be watching for in Florida? In Florida, one must be concerned with where the water is. The built environment here is always considered in terms of its proximity to the water. The opening of the Pérez Art Museum in Miami illustrated new potentials for articulating the edge between the interior and the exterior space, and also for the positioning of the building in relationship to the Biscayne Bay. The museum seemed to revive historic examples of vernacular architectures for addressing these concerns, drawing from references including an old community of buildings actually built out in the bay, called Stiltsville. We believe that architectural design is a process of accommodation, rather than scientific deduction. Our practice does not subscribe to predetermined biases. Instead, we search for the most appropriate solution to any given condition largely influenced by the specificity of the place and the particular needs of the client. Our work aims to be environmentally conscious, sensitive in its use of materials, and appropriate to its dimensions. We believe that there is no single truth in the production of meaningful design. Any upcoming project you are particularly excited about? We are currently working on a commercial brewery and tasting room that will be located in Hialeah, Florida, within a new district created to promote art and culture called the “Leah Arts District.” It will be the City of Hialeah’s first brewery. There is a rediscovery of Florida’s tropical vernacular and a return to that elemental knowledge in the use of louvers, screens and passive design strategies. These responses to site and climate are contributing factors for the implementation of current and new construction methods. Could you talk a bit about your studio’s process and philosophy? Our studio operates at the intersection of landscape architecture, art, and technology. We view landscape’s innate lack of resolution and inexactness as strengths. Our work strives to engage the in-between, the ephemeral, and the passing, and we embrace a mode of practice that alternates between art and design as essential methods of inquiry. One of the projects about which we are most excited is our Ecological Atlas, which attempts to simplify the visualization and understanding of the natural world. By using intuitive, graphic mappings that can convey changes in bloom times, deciduous tree patterns, produce seasonality, animal migrations, and other time-dependent phenomena, the Ecological Atlas facilitates a comprehensive understanding of the natural world in ways that are essential to building a sustainable and resilient future. It bridges art, science, and design, and connects the power of data and technology to the rich complexity of natural systems. 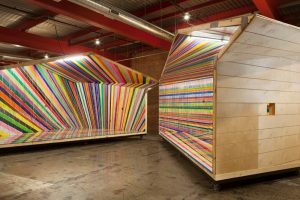 The Miami Beach Urban Studios is a research center on Lincoln Road that brings together faculty, students, and outside collaborators from seven different disciplines in art, design, and technology. The studio’s executive director John Stuart described it as “the love child produced by a wild night of beach partying with the MIT Media Lab and the Wexner Center at Ohio State University.” “If you want to see the creative soul of these other universities,” Stuart continued, “you need to know what these research centers are doing—it’s the same with our lab and Florida International University.” Stuart thinks of the facility as a “connecter or collider” where often disparate disciplines meet at the center’s unique 3-D printer—the largest in the world. The lab has 3-D-printed large-format images of a Morris Lapidus building in Miami Beach and multiple projects profiling potential scenarios and the effects of sea level rise on the community. A final project that demonstrates the diverse collaborators in the lab is a 3-D printed violin for students and veterans with prosthetics limbs. This project joined together representatives from the lab’s Human Sensation project with the FIU Adaptive Neural Systems Lab, the High Performance Database Research Center, the FIU VizLab, Venture Hive, Rokk3r Labs, and the World Council of Peoples for the United Nations. To view entire article published by ArchPaper’s April 2017 issue please click here.